The start to 1986 was particularly arduous. Snow had brought the rail network to a complete standstill. I worked from home and wanted one last check around my colleagues in the quadripartite agreement before I or anybody else in the UK dug any deep trenches. It was in fact the last point when the door was genuinely half-open for the UK to contemplate the wideband TDMA alternative. On the known facts everything pointed to narrowband TDMA being in the UK’s best interest but if the decision would inevitably slide towards wideband TDMA the UK would need a quite different negotiating position. Before the fateful Madeira meeting of the GSM, the experts were due to meet in the Hague to assemble the technical evidence. In these multi-lateral games it was essential to be two moves ahead. Supposing the Madeira meeting was inconclusive the matter would move up to the political levels very quickly. The technical evidence was likely to be a report an inch thick full of maths and graphs. Each side would selectively draw on the material that suited their position. Somehow GSM had to distil the choice into something much more condensed and readily understandable at a political level. That is far from easy. Between other jobs I kept fiddling around with the basic technical factors. By Saturday night I’d managed to distil them down to three tables. It was time to get a real expert involved. Ted Beddoes got to work and thought of a natty way of boiling a respectable comparison down to just one table. It was exactly what was needed – all a single page. The next week the French had called an unscheduled meeting of the digital cellular quadripartite group in Paris. It was just before the Hague meeting of experts. Their man would be in the chair. They didn’t want the meeting turning into a dog fight. They wanted the four countries to work together towards a common goal. We went around the table. Italy and the UK favoured the narrow band TDMA solution. An important argument was that the wide band TDMA solution was so complex that for some time only the SEL consortia would know how to industrialise it. 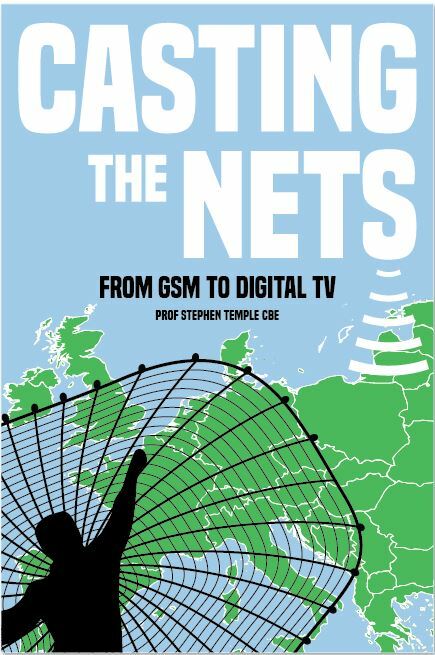 Where would be the competitive supply of mobiles? Philippe Dupuis made a strong point that the wide band TDMA solution was a fully defined solution from one company and therefore the industry could industrialise it immediately. On the other hand the narrow band TDMA solution had so many variants in different parts of Europe that the best part of 12 – 18 months would be lost arguing over details. 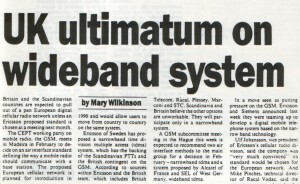 The only UK argument the France could accept as valid against the wide band TDMA solution was the lack of competitive supply of mobiles. This was not a promising start. The conversation then moved on to the meeting of expert in The Hague. The French chairman was a very clever engineer called Alain Maloberti from the PTT research laboratories CNET. I have met a lot of French engineers and they have all been good. But Alain was very very good. Alain said that he intended to try and go further than agreement to the broad avenues. For each avenue he would try and fill in a table of the major characteristics. This would be easy for the wide band TDMA solution was since there was only the one version on the table. The narrow band TDMA technology would prove more controversial. There were a lot of different opinions amongst the experts. He produced a table of the characteristics he had in mind. I recognised it as a solution, which a French company had tried in the Paris field trials, but putting right its main deficiencies. In fact what he proposed wasn’t all that far from the UK’s own test bed. Suddenly the pieces in that corner of the jigsaw fell into place in my mind. Turning to Philippe Dupuis I said that, supposing as part of the decision processes, the four countries supported the precise narrow band TDMA solution shown in Alan Maloberti’s table – wouldn’t that remove the French objection to time being lost in failing to agree parameters. Before waiting for an answer I turned to Armin Silberhorn. If three of your major partners supported the narrow band TDMA solution wouldn’t that create the conditions you’ve described for Germany supporting the narrow band solution? Continuing my act of levitation I turned back to Philippe Dupuis. That’s three countries potentially supporting narrow band TDMA technology. We’re so close. Can you support it under the conditions I’ve described? “Yes” he said after a long moment of hesitation. There was an atmosphere of disbelief. Had we really agreed to the narrow band TDMA technology ! We got down to business. Both Germany and France made it clear that they would need to continue to publicly support the wide band TDMA technology for domestic reasons. In Armin Silberhorn’s words we’d just agreed to parachute and land in the same field at the Madeira GSM meeting itself. We agreed to let the case for the narrow band TDMA solution come through at the Hague meeting of experts. Ted Beddoes left for the Hague. As we parted I said “Don’t forget, the only thing that matters is to get agreement on the one page table”. By the middle of the week he had not found the right opportunity to introduce his table.I suggested he lobbied a few people”. By the last day he had convinced most people that an Executive Summary was needed. In the middle of the morning of the very last day he produced his Executive Summary and distributed it to all delegates…at least to all those that hadn’t already left for home. The absentees by this time happened to include the German delegation and half of the French delegation. It was not done deliberately by Ted who had no way of knowing that others had booked early flights home that meant them leaving before the scheduled time. With strong Scandinavian support Alain Maloberti was forced to conclude that the meeting had endorsed the Executive Summary. It showed the clear technical advantages of the narrow band TDMA technology in a very simplified way. It was later to prove a very controversial table and there was resentment in both France and Germany that it had been sprung at the last minute in the Hague. The formal quadripartite meeting took place in London a few weeks later. The deal appeared to be holding together. The first day seemed to go well. Around 6pm Ted Beddoes excused himself to get changed for the dinner we were hosting that evening. In a rather low keyed way the German expert pitched into a criticism of the one page Executive Summary. He said that under something called “spectrum efficiency” they wanted the wide band TDMA and narrow band TDMA technologies to be given the same rating. Bernard Ghillebaert, senior and influential French Official, then pitched in with support. Within a few minutes a row had built-up. I called for an adjournment. Once outside of the room I demanded “What was all this about?” He said that the Executive Summary had been swung on the expert group through Ted Beddoes deliberately waiting until the German and French experts had left for home. I lobbed back that this was not the informal agreement we made in Paris that would allow the advantages of the narrow band TDMA technology to come through. Deuce! A calmer discussion followed. He explained that his internal report had gone up to his Minister and this had shown the two technologies as comparable for this parameter. I offered him a compromise of an asterisk and a footnote that some Administrations considered the two technologies as comparable on this characteristic. He agreed. Things were back on track…or were they? I was concerned at what this incident was signalling. On the one hand Bernard Ghillebaert was intellectually very sharp (an attribute that GSM was to benefit greatly from in managing such a large project through a committee) and very decisive. If he held a view he was more than capable of fighting for it very effectively. On the other hand both French and German officials had exposed themselves quite early in the game and the domestic industrial and political pressures on them were enormous. Where exactly did France now stand? After the dinner Robert Priddle and John Carrington concluded that things looked quite optimistic. I cautioned them that all may not be well. The next day we had the Chairman of the GSM Thomas Haug from Sweden as our guest. His interest was the success of the GSM Madeira meeting. An understanding of how the Madeira meeting would be handled was scripted. Having disposed of all of the technical reports Mr Haug would invite countries to express their preferences. All would be found to prefer narrow band TDMA technology except two. The two would be sent out to reconsider their position. They would then return and say that, in the interest of European unity, they would go along with the narrow band TDMA solution. There was a slight skirmish between Armin Silberhorn and Philippe Dupuis on precisely when they would return – before or after the narrow band TDMA parameters had been agreed. After our guests had left there was a press briefing. Interest in the Madeira meeting in the media had been mounting since October. A number of unhelpful articles had appeared. Most were ill informed. One had referred to a secret agreement between the UK and Sweden. Such an agreement was news to me and wasn’t helpful in confidence building with our French and German colleagues. However, since we’d given no information we only had ourselves to blame if the press became inventive. The reporters kept asking what the UK position would be if the rest of Europe backed the wide band TDMA standard. I thought I saw where the dangers lurked. I explained that we’d taken a lot of diplomatic soundings and as far as I could see there were only two possible outcomes to the Madeira meeting: either the meeting agreed upon the narrow band TDMA technology or there would be no agreement. This was a very accurate analysis. Only two countries were known to support the wideband technology whereas all the other countries with a view supported the narrow band TDMA technology. 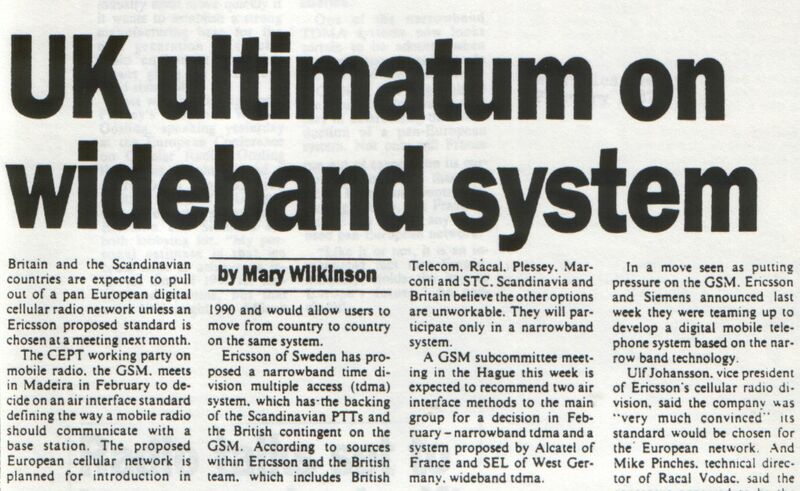 The gist of the article was that either the rest of Europe accepted the narrow band TDMA technology or the UK would block agreement.